Cemeteries are not only places where the dead are buried, they are ritual landscapes where several different activities related to commemoration of the dead can take place. This may include preparing the body, building burial pyres, and performing various rituals. 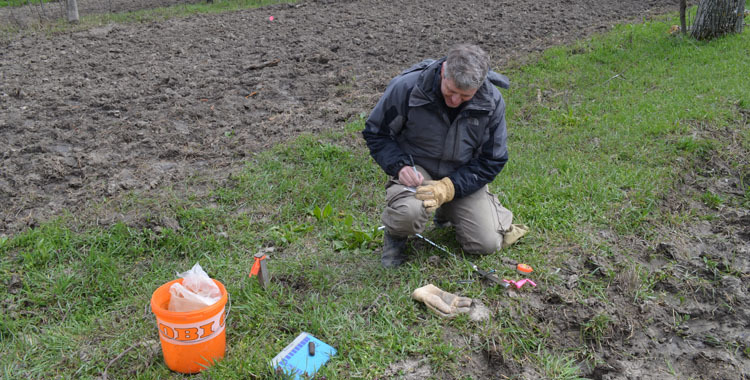 Sampling of archaeological deposits with a handheld push probe across the site allows us to investigate a much larger area than would be possible using only excavation. Sediment samples are also taken from excavation contexts for later multi-chemical analysis. All samples are characterized based on color, texture and inclusions, and tested for levels of available phosphate (Pav), pH, and magnetic susceptibility. Since fire and ash increase the magnetic susceptibility and pH of soil, changes in these could suggest the location of pyres and other features, such as roasting pits or food preparation areas.